1. Store mascot, Geoffrey the Giraffe will be replaced by Bibi the Beagle. Why? Research shows that short people were intimidated by the tall mascot all these decades, and the impressive size of Geoffrey kept them from the store. (this might be #fakenews…not sure yet.) Plus let’s face it—dogs rock. 2. The Barbie aisle will now be called “Women of Power” aisle. 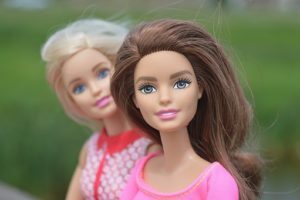 No longer will Barbie be linked only with Ken. She has options. She is free to date and marry Ken’s friend Todd and Midge as well—either one at a time or all at once. The Barbie aisle is a no-judgment zone. New Barbie figures will be added such as much anticipated “I Can’t Cook, but Ken Will” Barbie. Don’t be alarmed by the changes. Barbie will still have a great wardrobe, a cool convertible and/or SUV, the luxury townhouse and pointy, high-heeled shoes in all colors. She will also have teeny-tiny Dr. Scholl’s inserts to assist her in her daily efforts to climb to the top. And there will still be Bride Barbie although she will come with a pre-nup for her partner to sign. Go Barbie! 3. GI Joe action figures will still own shelf space but he will share it with GI Jane and GI Joe/Jane because everyone should be honored to accept anyone who wants to serve our country. By the way, only the army action figures will own military guns. Just a new rule—live with it. I hope this sale goes through. I would hate to see these stores disappear. 10 Responses to Toys ‘Я’ Us Making a Comeback? Maybe with a Few Changes? I am happy to live with the rule about only the military being able to have military guns. If only you were in the White House, Donna, instead of The Donald. If you ran the country as well as you run this site, it would be a much better place. I would definitely shop at your refashioned toy store. Well, maybe we should all buy it! As a woman of power, I want to know if Ken will be smooth or fully functional in this new store? I would think fully functional. That would only be fair–to Ken too. Maybe they could turn the company around if they first turned that “Я” around. Say it isn’t so, Don Don’s. If the bid isn’t successful, I’ll put a bid in myself. It might not be as high as $890 Million but I’m not toying around here! I read it on AOL news so you judge the facts. LOL But I know. I too will be sad Bill Y. I will give some to your bid too!